2019 was the thirtieth consecutive year for the World Challenge series. 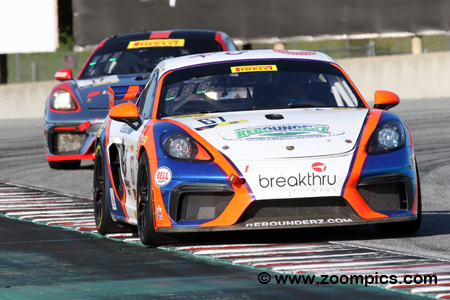 In the offseason, the Grand Touring Sport category was renamed, Pirelli GT4 America. The new title did a better job of describing this category as the cars were prepared to the FIA GT4 rulebook. Due to the popularity of this class, series officials offered are two regional championships for SprintX competitors – East and West. Sprint Schedule – The calendar starts with races at St. Petersburg, Florida in March followed by Long Beach, California. Teams return to the east coast where they will compete at Virginia International Raceway and Canadian Tire Motorsport Park. Then they travel to California for an event at Sonoma Raceway. On the Labour Day weekend, competitors will race at Watkins Glen International. The penultimate rounds are at Road America with the season concluding at the Las Vegas Motor Speedway in October. SprintX Schedule – This season starts at Circuit of the Americas and then shares weekends with the Sprint group at Virginia International Raceway, Canadian Tire Motorsport Park and Sonoma Raceway. The division remains on the west coast for an event at Portland International Raceway. The SprintX teams then rejoin the Sprint category for the final three weekends - Watkins Glen International, Road America and Las Vegas Motor Speedway. GT4 East Schedule – The eastern division also debuts at Circuit of the Americas. This weekend is followed by Virginia International Raceway, Canadian Tire Motorsport Park and Watkins Glen with the season ending at Road America. 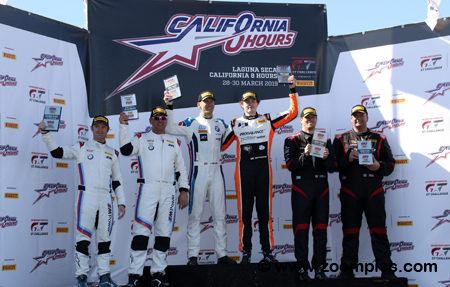 GT4 West Schedule – This schedule kicks-off at Circuit of the Americas. Then teams travel to the west coast with race weekends at WeatherTech Raceway Laguna Seca, Sonoma Raceway, Portland International and Las Vegas Motor Speedway for the finale. Cars competing in the Pirelli GT4 America category are similar to those the Blancpain GT World Challenge America class but have more preparation restrictions and are governed by FIA GT4 rules. The vehicles can be powered by forced induction or normally aspirated motors. Examples of car competing in this category include: Chevrolet Camaro GT4, McLaren 570S GT4, Porsche Cayman GT4 CS-MR, Porsche 718 Cayman CS-MR, Audi R8 LMS GT4, Ginetta G55 GT4, BMW M4 GT4 Mercedes-AMG GT4, Panoz Avezzano GT4 and SIN R1 GT4. 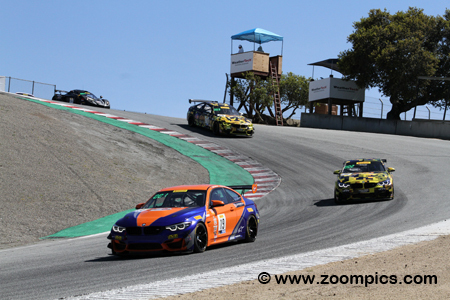 Rounds three and four of the 2019 Pirelli GT4 America SprintX West series were held at WeatherTech Raceway Laguna Seca. On Friday, teams would compete in two sixty-minute races around the eleven-turn 2.238-mile road course. 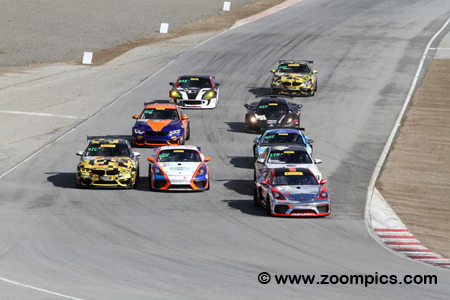 Nine GT4 America SprintX West competitors head into WeatherTech Raceway Laguna Seca’s corner two for the first lap of round three. Leading the way is the No. 17 The Racers Group prepared Porsche 718 Cayman CS MR driven by the pole-sitter, Derek DeBoer. Tucking in behind, DeBoer is the RHC Jorgensen / Strom Motorsports BMW M4 GT4 which qualified third. And, on the outside is the other TRG Porsche and ST Racing BMW. The Stephen Cameron Racing BMW M4 GT4 shared by Gregory Liefooghe and Sean Quinlan set the pace early, topping the timesheets in both practice sessions. Quinlan handled the qualifying for race one and was sixth quickest. They worked their way through the field and captured the overall win. In the afternoon’s race, Liefooghe started on the pole but the pair had to settle for a runner-up finish in the Pro/Am category. Amateur category driver, Derek DeBoer put the No. 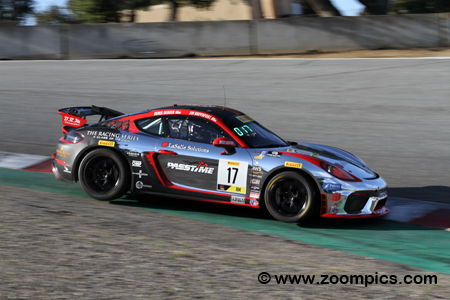 17 Porsche 718 Cayman CS MR on the pole for Friday’s first event. Sharing the Porsche with DeBoer was James Rappaport. Unfortunately, the duo fell off the pace and finished seventh overall but succeeded in grabbing the last position on the class podium. In the weekend’s second contest, they started at the rear of the grid and finished fourth in their category. The season, the 2018 Touring Car champion, Vesko Kozarov was sharing a Reardon Racing prepared Audi R8 LMS GT4 with Jeff Burton. They started the first race of the weekend fifth overall and fourth in the amateur category but captured the class win. This was some redemption for their disastrous outing in round two at COTA when their race ended with an accident on the first lap. In the second contest of the day, they were second in class. Friday afternoon and the Pirelli GT4 America SprintX West podium for the Amateur category. On the right from Reardon Racing are the runner-up’s, Jeff Burton and Vesko Kozarov. On the opposite side of the rostrum are third-place finishers, Daren Jorgensen and Brett Strom who bounced back from mechanical issues in the morning’s race. In the center are the winners, Kevin Woods and Chris Bellomo from TRG. 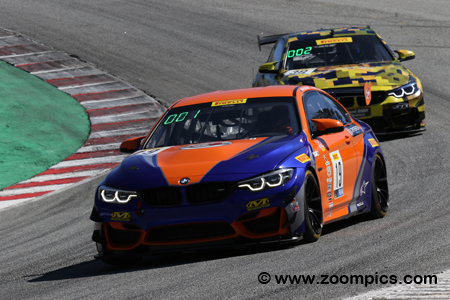 The first lap of round four through the ‘Corkscrew.’ The pole-sitter, Gregory Liefooghe driving the Stephen Cameron Racing prepared BMW M4 GT4 leads the field of nine starters. Behind Liefooghe are the ST Racing BMW M4 GT4s of Jason Wolfe and Harry Gottsacker which started second and third, respectively. 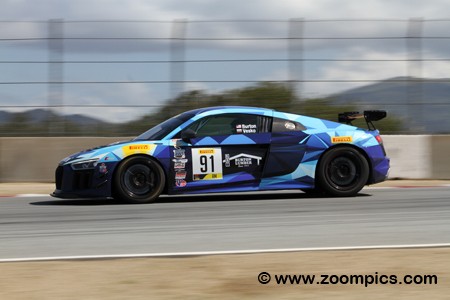 At the top of the ‘Corkscrew’ is Mark Pavan driving a Sin R1 GT4 prepared by Racers Edge Motorsports. Teaming up in the No. 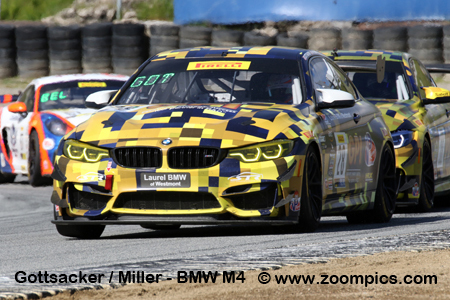 28 ST Racing BMW M4 GT4 was Harry Gottsacker and Jon Miller. Miller qualified the BMW first in the Pro/Am class for round three. During the contest, Gottsacker received a drive-through penalty for leaving the pits too early – the pair finished fourth in class. In the afternoon event, Gottsacker started in third place. Learning from their mistake in race one, they captured the overall and class victory. 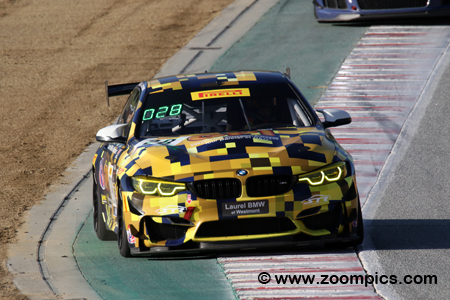 Unlike the other competitors participating at WeatherTech Raceway Laguna Seca, Mark Pavan and Bob Michaelian did not enter the first two rounds at Circuit of the Americas. Racing a SIN R1 GT4 prepared by Racers Edge Motorsports, Michaelian qualified seventh in race one and the pair finished second in the Amateur class. In the afternoon’s contest, Pavan started first in class but they encountered issues and were last in their category. 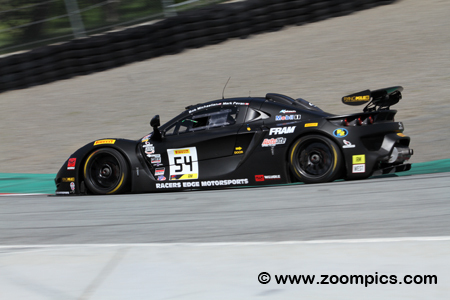 Entering round three at WeatherTech Raceway Laguna Seca, drivers Kevin Woods and Chris Bellomo lead the SprintX West Amateur division. In qualifying for the weekend’s first race, Woods was second quickest and shared the front row with his TRG teammate, Derek DeBoer. They were unable to maintain the pace of the leaders and finished eighth overall. Later that day the duo fared much better and captured the class win. 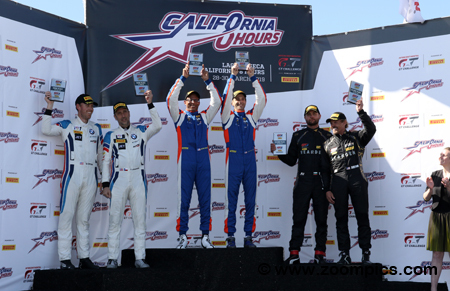 In the center of the rostrum are round four Pirelli GT4 America SprintX West Pro/Am winners, Harry Gottsacker and Jon Miller. The victory made up for the confusion during the weekend’s first race which resulted in a penalty. The win also moved the pair to the top of the class standings. The second-place finishers, Greg Liefooghe and Sean Quinlan, are standing on the right. Completing the podium are Jeff Bader and Casey Dennis.